The Farwest nursery show is the biggest green industry show in the west. Thousands of growers, buyers and suppliers come each year to Oregon—widely considered to be the “nursery capital of the US”—for the latest information on plants, equipment and strategies. Before the show, participants can sign up for various tours, including a tree tour and retail center tour. 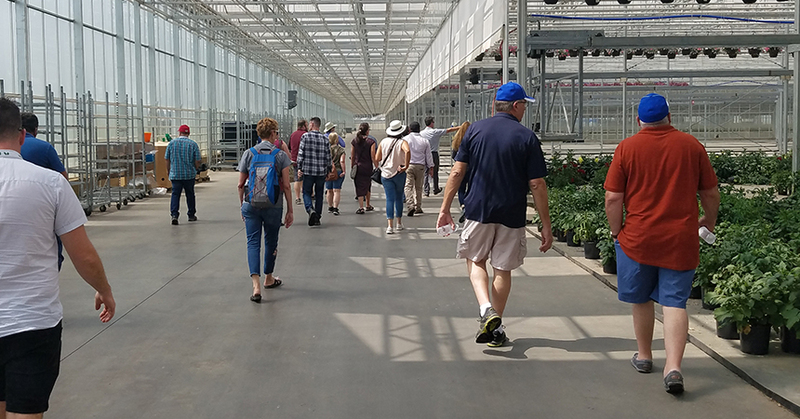 This was the first year Farwest included an energy efficiency tour with stops at several nurseries around the Willamette Valley. Twenty-seven tourists from Oregon, other states and as far away as Australia loaded onto a bus and enjoyed stories about Oregon’s rich agricultural history. They learned about how the Missoula floods washed away much of the ground’s top soil, contributing to Oregon having some of the best growing soil in the west. The tour visited F&B Farms in Woodburn, Terra Nova Nurseries in Canby, Anderson Pots in Portland and Smith Gardens in Aurora. At each nursery, owners explained how they completed energy projects and how they worked with Energy Trust to receive technical assistance and cash incentives. Tour guide Ulrike Mengelberg, an outreach manager for Energy Trust, provided materials about energy-efficient upgrades available for nurseries and information about how to apply for cash incentives to help offset project costs. Meet the Champion: Andy Couch, Umpqua Dairy Products Co.